Not that I made mine in the morning, it was more like late morning when I started and by the time they were baked it was time for tea. 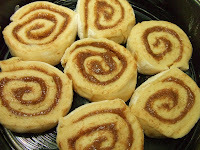 Funny thing was I wasn't even sure if my rolls would turn out like what cinnamon rolls should taste like. 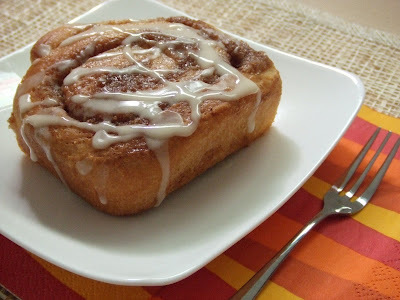 Why you may ask ...... simple - I've never made cinnamon rolls before and this would be my first attempt at it. The instructions to this recipe seems some what lengthy but don't despair, it's actually quite simple after all. It's the "waiting around" for the dough to proof that takes time. I ended up watch telly in-between the proofing period. The end result was well worth it! The smell of cinnamon rolls baking in the oven permeated the entire apartment. Heavenly! I ended up with more rolls that what the recipe states - more like 12 rolls. My husband and I whacked 2 rolls during tea time. I packed about 6 rolls for a friend of my husband who had volunteered to be a guinea pig for my cooking ventures. He also volunteered his wife and 3 teenagers as "tasters" as well - hmm not sure if they had signed the consent form or not. The remaining rolls I packed away for next morning's breakfast. 1) In the bowl of your electric mixer, with the paddle attachment, combine 2 1/4 cups (315 grams) of the flour and the yeast. 2) In a small saucepan, stirring constantly, heat the milk, butter, sugar, and salt just till warm (120 -130 degrees F) (49 - 54 degrees C) and the butter is almost melted. 4) Shape into a ball. Place the dough into a greased bowl, turning once. Cover and let rise in a warm place till double (approximately 1 - 1 1/2 hours). 5) When the dough has doubled in size punch it down. Place onto a lightly floured surface, cover with a clean towel, and let rest for 10 minutes. 6) Meanwhile, combine the ingredients for the filling. In a medium-sized bowl place the brown sugar, flour, and cinnamon. Stir to combine. Cut in the cold butter with a pastry blender, or two knives, until the mixture is crumbly. Set aside. 7) After about 10 minutes, roll the dough into a 12 inch (30 cm) square. Sprinkle the filling evenly over the rolled out dough and top with raisins (if desired). Carefully roll the dough into a log and pinch the edges to seal. Slice the log (roll) into eight equal-sized pieces. Arrange dough pieces in a greased 13 x 9 x 2 inch (33 x 23 x 5 cm) baking pan. 10) If necessary, to prevent over-browning, cover rolls loosely with foil the last 5 to 10 minutes of baking. Remove rolls from oven. Brush again with half-and-half or light cream. Cool 5 minutes and then invert onto a baking rack and re-invert onto a serving plate or platter. 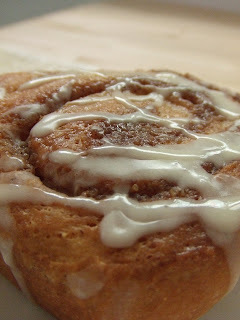 11) Drizzle with the Powdered Sugar Glaze and serve warm or at room temperature. Mmmm love cinnamon. Would love to be in your kitchen after the baking - just for the smell alone! They were mighty generous too. Yum! With havin so much content and articles do you ever run into any problems of plagorism or copyright infringement? My website has a lot of exclusive content I�ve either created myself or outsourced but it seems a lot of it is popping it up all over the web without my authorization. Do you know any solutions to help reduce content from being ripped off? I�d truly appreciate it.